Yasssss!!! Women, Mothers, Cooks, Chefs, its definitely time for you to upgrade your pantry, kitchen, receipe with the latest food in town known as “ENOMOS” which we highly recommend, but first hear us out!! Enomos assorted foods is into quality bio-products that contain protein from fresh water base fish for healthy consumption. Also, we focused on producing African traditional seasonings in new dimensions such as locust beans seasoning with fish and fermented melon that is mixed with fish in a neatly, healthy and superb taste to that of olden days in a hygienic form. 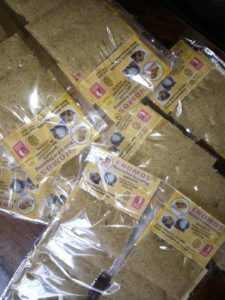 We produce powered Ogbono soup mixed with assorted fish and crayfish (wild mango seed) and real raw unpasteurized honey. We are organic foods company. 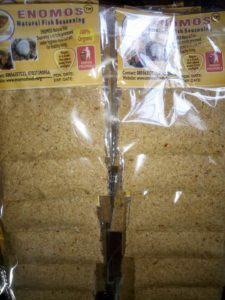 Enomos is initially focusing on the development, production and marketing of natural seasonings in NIGERIA, CANADA, USA, UK, and EUROPE as Nigerians in these counties eagerly long for the taste of our local dishes as a result of the quantity of processed food invading the stores which are more genetically modified in those countries are detrimental to their health. They see our product as opportunity for eating organic foods and reminds them of home. This a natural fish seasoning for all kinds of cooking’s. This product is 100% natural. Organic seasoning. Ingredients- Assorted fish, Cray fish and a pinch of salt. Fish and shellfish are brain food because crayfish and other shellfish do indeed have nutrients that stimulate mental energy: The Amino Acid is well balanced compared to plant source. Our products are meant for those customers who love eating natural foods and conscious of their health. Simply pour one or more sachets into your pot of stew, soup, beans, spaghetti, Moin Moin, draw soup etc. Enomos Ogbono soup– This is the grounded ogbono (apon) mix with fish and crayfish. Organic product. Ingredients- Wild mango seed (apon), assorted fish, crayfish and scent pepper. Several research and studies have shown that ogbono seed or kernel contains about 18 amino acids and is a good source of nutrients such as calcium, magnesium, potassium, sodium, phosphorus and iron. The research also showed that the seeds have beneficial effects on diabetes and obesity as well as lowering cholesterol, and increasing antioxidant and gastrointestinal activity. Enomos fermented melon– This is the African traditional seasoning which is called ogiri by Yobuba, Une by Igbos. Organic seasoning. It allows easy releasing of gas from body. It settles the stomach and highly rich in protein. Iru by Yoruba, Dawa dawa by Igbos. It is referred to as African locust bean with botanical as Parkia Biglobosa. Organic seasoning. Ingredients- Grounded locust beans, assorted fish and crayfish. The most valuable parts of the locust’s bean are high in lipid (29%) protein (35%), carbohydrate (16%) is a good source for calcium. The locust beans help in controlling diabetes. It helps to promote good sight. It is a potential benefit for enhancing weight loss. ENOMOS Motto: The journey to your healthy living starts with what you eat.